Like many other Louisiana cities, the history of Alexandria and the history of its Jews are inextricably intertwined. Jews have lived in Alexandria, located on the Red River at the geographic center of the state, ever since the early 19th century. Jews helped build the town into a regional trading and transportation hub. While Jews have never constituted a large percentage of the city’s population, they have contributed greatly to the city’s economic, civic, political, and social development. When Jews first arrived in Alexandria is the subject of debate. Samuel Korn of New Orleans purchased real estate along the Red River, just outside of Alexandria, in 1810. He then hired an architect to build two houses. However, census records from the first decades of the 19th century list neither Korn nor any other Jewish names. Most scholars now contend that the one of the first Jews to settle in Alexandria, if not the first, was Henry Michael Hyams. Hyams came to Alexandria in 1830 from New Orleans, where he studied law at the suggestion of his cousin Judah P. Benjamin. After his arrival in Alexandria, Hyams joined the firm of Dunbar and Elgee and operated a plantation. In later years, Hyams moved back to New Orleans and served both as a state senator and as lieutenant governor in the Moore Administration. A wave of Jewish immigrants settled in Alexandria in the decades before the Civil War. Many of these immigrants came from France or Germany; later, Jews from Russia came to Alexandria. After their arrival, Jews soon began to open businesses in downtown Alexandria. In 1844, a corner store called Hecht & Co. opened and sold a variety of apparel for both ladies and men. A. Klotz, another Jewish merchant, opened a store and warehouse to sell both cotton and coffee. This surge in the number of Jewish-owned businesses is reflected in the number of Jews living in Alexandria. While the 1850 census listed only 24 Jews in Rapides Parish, the 1870 census listed 157 Jews, most of whom lived in Alexandria. It is important to remember, however, that the census did not count the large quantity of transient Jewish peddlers who sold dry goods, clothing, and jewelry. Some of these peddlers, and especially those who recorded great profits, eventually settled down in Alexandria and opened their own stores. In 1859, Alexandria’s Jewish community formed a congregation named Gemiluth Chassodim (Acts of Loving Kindness). By the 1870s, many prominent Jewish merchants involved themselves in civic, social and political affairs. 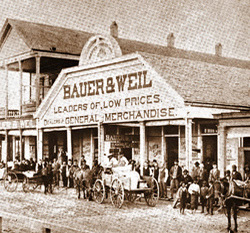 Julius Levin emigrated from Prussia in 1853 and, after having served in the Confederate Army, opened successful mercantile and lumber businesses. Levin also served on the city council and as president of the school board for several years, becoming one of Alexandria’s most well-respected and progressive citizens. At the time of Levin’s death in 1910, a group of African Americans in Alexandria published a letter in the Alexandria Daily Town Talk that eulogized Levin as a “true friend of our race as well as to humanity.” Jonas Rosenthal emigrated from Alsace in 1860 with his brothers Isaac, Mires, and Moses. Jonas and his brothers started a retail grocery store in downtown Alexandria known for its “quick sales and small profits.” After this lucrative venture made him a wealthy man, Jonas Rosenthal became a city council member, postmaster of Alexandria, and a member of the Rapides Parish Executive Committee of the Democratic Party. He also served as the longtime president of the school board. A local elementary school was named in his honor. The other Rosenthal brothers also served the city with distinction. Mires, after operating the grocery store as well as a cotton brokerage house, worked for the U.S. 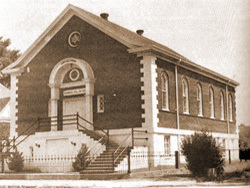 Circuit Court for Rapides Parish from 1889 until his death. Moses served as U.S. Supervisor and Election Commissioner for Alexandria in 1876 and was elected to city treasurer in 1878. Several Alexandria Jews enlisted in the Armed Forces in the decades following the Civil War. Israel Pressburg enlisted in the Army to fight in the Spanish-American War in 1898. When he arrived late at his base after a furlough in New Orleans, the Army charged him with desertion and a court martial found him guilty. Pressburg was sentenced to one year of hard labor, but President McKinley pardoned him several months later. Israel’s younger brother, Sol Pressburg, served in the non-flying aviation corps of the Army during World War I. The Schmanlinski family owned “E. Schmanlinski and Son,” a music store in the downtown area that sold pianos, organs, and other musical instruments. Carl August Schnack’s jewelry store became a popular place for young couples to buy their wedding rings. His store relocated in 1931 to a new building downtown, one that has since been placed on the National Register of Historic Places in recognition of its unique architectural features. Caplan’s men’s clothing store opened in 1891. 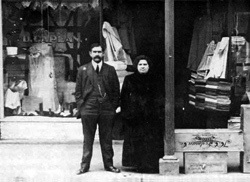 After arriving in Alexandria as a peddler in the late 1880s, David Caplan opened his store, which quickly became the best known men’s store in the city. This family-operated store still exists today. As one of the most venerable institutions in Alexandria, Caplan’s has bested fierce competition from larger retailers. Alexandria’s Jewish community united against the rise of anti-Semitism in Europe during the Second World War. The City of Alexandria had offered sanctuary to Jewish refugees fleeing Nazi persecution in 1938. Once the United States entered the war in December 1941, however, the situation in Europe hit close to home for Jews in Alexandria. Soldiers populated Army camps near Alexandria, including Camp Livingston, Esler Field, and Camp Beauregard. To help the war effort, local Jews extended their support to military personnel stationed in the region and “always responded to the religious and social needs of the Jewish Soldiers.” Many also volunteered their time and labor at the local Red Cross and Salvation Army chapters. Jewish soldiers felt indebted to the kindness of Alexandria’s Jewish community and, in return, the Jewish soldiers, under the leadership of Chaplain Sidney Lefkowitz, threw a Chanukah party in honor of their Jewish friends in the community in 1942. The large number of soldiers stationed in the area was good for businesses in Alexandria. On Saturday nights during the war, when soldiers traveled to downtown Alexandria to enjoy time off, some stores had to limit the number of customers who could shop at one time. In recent decades, the Jewish population of Alexandria has declined sharply. In 1980, 760 Jews lived in Alexandria, by 2001 there were only 175. Despite this drop in population, Alexandria has come to cherish the rich history of its Jews in recent years. In 2002, the high school’s theater troupe put on a production of “Fiddler on the Roof.” At the same time, the Alexandria Museum of Art and Gemiluth Chassodim presented a joint exhibition entitled “From Anatevka to Alexandria,” which traced the history of the city’s Jews “from the first person who arrived in Mid Louisiana to the present generation.” Many decedents of the individuals highlighted in this popular exhibition still live in Alexandria. The success of this exhibition and other Jewish events bears testament to the continuing vitality of Alexandria’s Jewish community.